End of the year got you stressed out? These awards are cute, quick, and easy to use! Easily edit, print, and pass out. Your students will LOVE these fun awards! 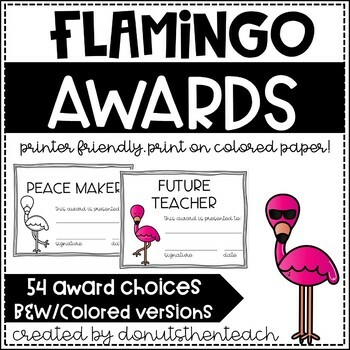 These cute FLAMINGO end of the year awards are completely EDITABLE! Please note the awards come in a PDF, but an editable PowerPoint is included. Please note that the award names ARE editable, so you can change them if you wish. Feel free to ask any questions before purchasing!